As I've mentioned before, I like to be surprised by stories, so I do my best to avoid "spoilers" (things that give away the ending). This can sometimes be a challenge, particularly when there's a timelag between countries, but I've got the hang of it now, and I'm pretty good at avoiding the relevant places (e.g. websites/newsgroups) until I've seen the episode, read the book, or whatever. On the flipside, most people are fairly polite about it, and will make an effort to warn everyone else (e.g. "Here's my review of the latest Dr Who episode, spoilers behind the cut tag"). However, this isn't always the case. In one of the Marvel comics published this week, a well known character dies. I haven't read the comic in question, but I know this because it's been announced in various locations, such as the BBC news website. The character's name is given in the title of that page, which also means it shows up in the link from other pages on the site; right now it's the top "Arts" headline on the main Entertainment page, and I think it was on the front page of the website earlier today. That article is timestamped at 16:14 yesterday (Thursday 8th March). To put this in perspective, American comics are published on Wednesdays, and then arrive in the UK on Thursdays. (They can be delayed by bank holidays, but that's not the case this week.) If you live in London, you can get the new comics from noon on Thursday onwards, although people who don't work near a comic shop will probably wait until Thursday/Friday evening. If you live outside London, you have to wait until Friday for them to be redistributed (based on my experience in Oxford and Durham). So, I think it's fair to say that most people won't have made it to the shop before that headline went live. There is a judgment call about how long you should wait, but I think that four hours is pushing it a bit! This doesn't directly affect me, because I've only been reading that comic in paperback collections (rather than monthly issues), so I would have heard about it eventually anyway. However, I do think that the BBC have handled this badly. By way of analogy, when Harry Potter and the Half-Blood Prince was published a couple of years ago, it was announced in advance that one well-known character would die. This book was available in shops at midnight, so would it have been ok for the BBC to print the identity of that character in a headline at 4am, where everyone would see it the following morning? Is it ok to reveal a secret like this after four hours? Edit: Comments to this entry include spoilers (i.e. the name of the character concerned), so don't click through unless you want to know. So, there's a difference between this story and the potter one, in that this is closer to being actual news, of general interest. I won't say why, since I notice how careful you've been to avoid spoilers here, but it is. That being the case, it's something that should be reported in news sources. If you're going to report it in news sources, then there are two questions: Timing, and manner of reporting. The former is easy for a newshound - as soon as possible. This may not be the "right" choice, but it's unlikely to even have occurred to the writer as a choice at all. As for the latter - well, do you expect the headline to be "comic book character dies"? Annoying certainly, but to be honest, it's a miracle it didn't leak and get reported far sooner. I think the most practical solution is for comic book authors (and tv writers, and so on) to be aware of the system they're operating in, and use it to their advantage. Look at how we always all know when Dr Who is going to die, and what his reincarnation is going to look like before we get the chance to see the show. That's fine - the writers allowed for it. When Sherlock Holmes died, the serialised story was entitled "The Adventure of the Final Problem" - there was no way Doyle was going to be able to spring that on the public, so he just went with it. So, in answer to your poll, I'm choosing option 3: "Yes, everyone's doing their job. There's no 'fault' anywhere - the news stories should be treated like a prologue - they're a part of the reading experience just like the physical comic itself, the teaser cover art and the fansite analysis that happens afterwards." Honestly, I'm surprised that this would be of general interest - have that many British non-comics readers even heard of Captain America? I remember when Superman died in the early 1990s, just when I was first getting into US comics, and I naively assumed that this was permanent. Anyway, I can see why that's a significant news event (since he's widely known), and DC had a storyline leading up to it called "The Death of Superman" so they were hardly being discreet. In this case, I'm inclined to say that people who read the comics would prefer to find out by themselves, and people who don't read them wouldn't be bothered about waiting a week. Mind you, regarding the permanence of the death (or lack thereof), the latest Dork Tower strip is quite good. Regarding Dr Who, I mentioned that in a previous post; I think it weakened the final episode of the series before last when I knew which actors had already renewed contracts and which hadn't. Having said that, I think there was some nice misdirection at the end of the latest series. Still, this does seem to be a newer trend, at least for me. When the 5th Doctor became the 6th, I didn't see it coming (back when I was at primary school). I've found the same thing with other TV series. For instance, when I saw "Back to reality" (the final Red Dwarf episode in series 5), I really thought that it was the end of Red Dwarf altogether (as did everyone else in the room with me). Much the same applied to "Buffy" season 5; I only realised how it was going to end about 30 seconds in advance, which gave it a much greater impact. There was a similar problem of spoilers with the Dr Who Christmas episode in 2005, as I discussed here (the BBC website gave away the ending of the episode and only updated the article with spoiler warnings after it was too late for me). As with yesterday's comic article, I'm willing to chalk them both up to incompetence rather than malice, and I accept that people make mistakes. However, I still think it's worth recognising that these were mistakes, in the hope that they can be avoided in the future. If I ever figure out the "contact us" system on the BBC website then I'll convey these sentiments to them. Having said all that, I don't mind reading spoilers for a story that I'm not intending to read/watch, and there are some situations where it will then motivate me to seek out that story. I just think that you should give people a fair chance to be unspoiled first. That's why I stopped following the rec.arts.comics. * newsgroups, and it's why I may now give up on the BBC website. Yes, it's of general interest, because it's political symbolism. The BBC article in question mentions things like Cap first appearing on the cover of a comic "punching Hitler". The idea of him being assassinated at a time when Bush is losing his power and US generals are saying things like Hey, maybe we should actually try talking to folk before killing them is significant. 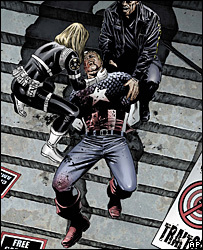 If you take the naive view, and assume that the death of Cap is synonymous with the end of that comic book (even for a little while, before they get around to doing a resurrection story in a few years), then the message is "patriotism doesn't sell right now". If it's the precursor to a 90's superman style "Cap's big shoes" type story, then the message is "patriotism needs re-examining in the modern world". So, first of all, we can tell that we're not looking at the end of the Cap - we're looking at a new beginning. A re-analysis of the kind of patriotism that America needs in these uncertain times, where the hi-tech industrial war style of WW2 doesn't work, and low tech, hearts and minds guirilla war is where it's at. A re-branding of the old symbol of patriotism to fit in the new world. Secondly, we know that this story wasn't written by a journo out looking to report something interesting. It's a blatant copy of a press release, written by Marvel, designed to encourage sceptical, politically aware comics fans who've long since given up on Cap as "cheesy" to take a new look at the series. Why would Marvel wait for a week or two to announce something like that? It would be a damp squib - old news. The news feeds wouldn't carry it, and even if they did, it wouldn't have the marketing effect they want. I'm guessing that there's actually close to zero meaningful spoiler here too. I'd be very surprised if the picture that comes with the press release weren't also the cover of the issue in question - and it does give everything away. I'm willing to chalk them both up to incompetence rather than malice, and I accept that people make mistakes. However, I still think it's worth recognising that these were mistakes, in the hope that they can be avoided in the future. I disagree with your unstated assumption that it has to be either incompetence or malice. I think what you're seeing is an example of competence on the part of all involved. Prepare to be shocked :) This is the cover of the relevant issue (Captain America #25) - it shows a newspaper with splatters of blood, and a red gloved hand in hand-cuffs, so there are hints towards the event but it's not that blatant. More generally, comic covers tend to be a bit misleading (I have a longer post planned about this). For instance, last month's issue of "Friendly Neighborhood Spider-Man" (#17) shows the Sandman attacking Spidey from behind (while he's in the black costume) and forcing enough sand through for it to come blasting out of various holes. This scene does not appear anywhere in the issue; the only time Peter and Sandman, he's in plain clothes, they're facing each other, and Sandman is actually trying to restrain him. So, in that context I don't think people would see the Captain America cover and immediately know what was going to happen inside. I can see why people would come to that conclusion, but I'm not sure whether that's really what's going on. The article doesn't mention the reason that Cap was on the steps of the courthouse (or wearing handcuffs), and this is closely related to the recent "Civil War" storyline (which I'm also going to post about!). Without giving away too much, the basic premise of that storyline was a superhuman registration act - should people be able to run around anonymously in masks, or should they all have to be registered with the government? Captain America led the "anti-registration" movement, while Iron Man led the "pro-registration" group. While there are political parallels to that (e.g. the USA Patriot Act, national ID cards), I'd say that they're really about internal affairs rather than foreign policy. "Best effect" for a publisher or a commercial writer is measured in sales. For the publisher, yes. For the writer, I'm not so sure; I'd like to think that they're concerned with telling the best story they can, and I know of a few cases where writers have left a particular title because they disagree with what's been imposed on them. E.g. Bill Watterson stopped Calvin & Hobbes because he didn't like the commercial pressures for merchandising, and Peter David left The Incredible Hulk after a 12 year run because he was told to make the character stupid again. Taking this further, I don't think that a company like Marvel is really a monolithic entity. Instead, there are various people who work there, who have different goals. One relevant example is the feud between John Byrne (writer/artist) and Peter David (now a writer, formerly in the sales department), as described here. Basically, Byrne was annoyed because he thought that PAD had publicised the ending of a particular issue (where a character died), thus spoiling the story for the readers. By way of contrast, look at The R2 project (news about region 2 DVD releases). All of their announcements are flagged at the top as "Official Announcements from the PR companies", so you can distinguish between them and the reviews on the site, and apply the appropriate amount of scepticism to claims like "the funniest comedy of the year". Are you really saying that you think this is the right way for the BBC to act? I can forgive lazy reporting, but this sounds as if you're saying that they should be praised for acting as a corporate mouthpiece without giving any thought to what they're repeating. Literally hundreds of media organisations worldwide have reported the news in question, which I think is pretty strong evidence that it's considered generally newsworthy. And I'd agree with totherme that that's probably because of the symbolism involved. Even if we assume that it's in Marvel's best interest to increase sales on the book, surely that shouldn't be the BBC's goal? What else should the BBC and the rest of the media have reported, given that their judgement was that there would be significant interest in the story by the general public? If Marvel have done their job right (and it looks like they did), there is probably nothing worth reporting that isn't in the press release. They've turned it into a win-win situation: the media gets a story with no effort required, and they get the publicity. Being an occasional corporate mouthpiece doesn't preclude simultaneously being a responsible news source. Out of the first 20 results, item 7 (as of the time of writing) is an article about "Dodge's new super hero: The Avenger", i.e. a new car, and nothing to do with the recent death. Similarly, item 11 is a story about an exhibition of African men's dress and costume, attended by a guy who wrote the Captain America comic for a while. Item 18 is from a comics website, which is where I'd expect to read about the week's comics (i.e. I'd avoid it until I'd read those comics myself), and it's really talking about the reaction to the event from the big news organisations rather than actually reporting that news directly itself; in a similar way, I'd guess that lots of the local news sites are just repeating what they've heard on CNN. I haven't checked the full list of links, but I would be hesitant to say that there are actually hundreds of reports on this. What else should the BBC and the rest of the media have reported, given that their judgement was that there would be significant interest in the story by the general public? I don't really mind them reporting it, although if this was just a copy of a press release then I think they should state that clearly on the webpage. However, I do think that they should have waited for a while, to give people the opportunity to read the story "unspoilt" first. totherme wrote earlier: This may not be the "right" choice, but it's unlikely to even have occurred to the writer as a choice at all. That's what bothers me - the idea that the BBC would publish something without actually thinking about it. However, to answer your question more directly, one useful piece of information would have been the issue number (Captain America #25) rather than just referring to "the latest edition". It's interesting that the article says "The latest edition will show the superhero dying" (my emphasis). That implies that they didn't realise the comic was actually available in shops yet, so they hadn't even given a 4 hour window for people to read it; they thought that they were announcing the news before it was possible for anyone to read the comic. Speaking of which, there's another idea - maybe the BBC should have tried to get hold of a copy themselves, so that they could read it before writing about it? Call me wacky, but that's the kind of basic research that I'd expect from a 9 year old writing a book report in English class, let alone a professional news organisation. If they'd sent someone along to the local comic shop, maybe it would then have occurred to them that the other customers would like to read the story without having the ending blurted out in advance. I think the real problem here is the perception that news reporting is a race: you have to report things quickly, otherwise you'll get "scooped" by the competition. If you were hearing about this for the first time (as a non-comics reader), would there be really be that much difference between "Marvel is going to kill off Captain America next week" and "Marvel killed off Captain America last week"? I'd prefer to see respectable news organisations take their time, unless it's a life-threatening emergency situation. As one other example, have you seen the Terminator films? Trying to be vague again, there's a scene near the start of "Terminator 2" (where Arnie is heading down a corridor towards a young John Connor, swinging a shotgun up); I knew how to interpret it, due to advance publicity, but I think it would have been a lot more effective if I'd been able to take it at face value. Spoilers are annoying, and it's a continuing source of disappointment to me that copyright-holders deliberately reduce the impact of their own media in that way. As for the latter - well, do you expect the headline to be "comic book character dies"? Editor's Note: The following story reveals information about the Marvel Comics' "Civil War" storyline and a key character. If you'd rather not know, stop reading now. If the enjoyment of the story is destroyed by knowing how it ends then to me it would be an inadequate story. The pleasure and the adventure should be in the journey, not just in the destination. If the only ace it has up its sleeve to excite the reader is the event of the death then what's the rest of the story for except to fill up space until the inevitable? I happily read and re-read books, knowing full well exactly what the twist at the end is, or what the characters are going to wind up doing. It doesn't stop me enjoying the books in the slightest, as I know that I have chosen to read quality writers who will keep me engaged and entertained along the way regardless of what I know of the events still to come. I still like the film Vanilla Sky, even though I know exactly what the big twist at the end is. I can still enjoy it as a relatively clever and well-made piece of cinema. That's a fair point; there are certainly books that I have read several times. I can't comment on the details of this particular issue, because I haven't read it yet, but I have been impressed by the writer's previous issues (I've read the paperback collections twice). I think I see it more as a sliding scale than an "all or nothing" thing. In other words, a good story can be even better if there's something that surprises you the first time around, and I think it's a shame to deprive people of that opportunity. I think there are some stories which actively benefit from a second reading, since you can then see the foreshadowing for what you know is coming, and interpret words/actions in a different light. Having said all that, I also think there are some stories which are only intended to be read/seen once, and that's ok. I'm thinking about murder mysteries in particular, although not all of them will fall into this category. In a story like that, the payoff is the ending where the murderer is revealed, but the rest of the story isn't just filler - it's guiding you to that point. An analogy might be a sporting event such as a football match, although since I'm not a sports fan this may be a flawed analogy :) I think there are some moments that can be appreciated on their own merits (e.g. a goal scored from the opposite end of the pitch), but it mostly comes down to a case of rooting for your team. I gather that this is why match results are normally preceded by "If you don't want to know the result, look away now" - that way, if you've recorded the game and haven't watched it yet, you don't get the ending spoilt for you.